An image showing House Speaker Nancy Pelosi clapping during President Donald Trump's State of the Union address Tuesday night went viral, and soon Pelosi's daughter provided her insight on the moment. 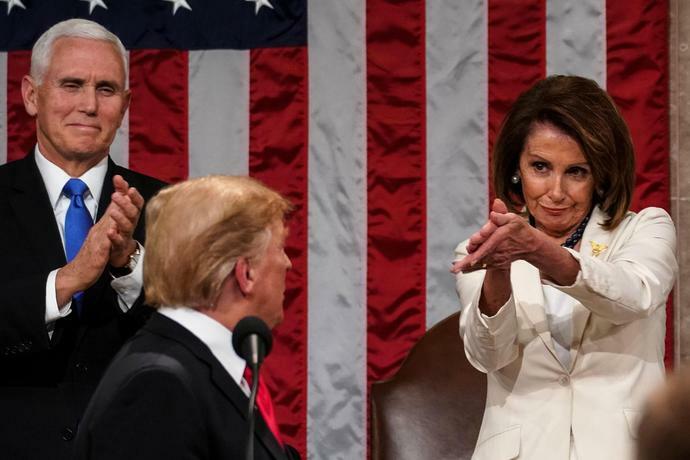 The image shows Pelosi grinning mid-clap, locking eyes with Trump. The exchange happened after the president called for the end of "the politics of revenge, resistance and retribution." Christine Pelosi posted to Twitter Wednesday that the image reminded her of her teen years: "She knows. And she knows that you know. And frankly she's disappointed that you thought this would work. But here's a clap. #youtriedit"
The interaction comes weeks after a standoff between Trump and congressional Democrats led by Pelosi which led to a partial government shutdown that lasted for more than a month. As Trump demanded funding for a border wall, Pelosi insisted negotiations must occur while the government was open. Trump ultimately agreed to temporarily end a 35-day government shutdown in late January, even though the short-term funding bill included no money for his border wall. Social media users widely described the clap as sarcastic. The image also inspired photoshopped memes showing Pelosi condescendingly clapping in various situations, as documented by the HuffPost. More: President Donald Trump says he wants bipartisanship, but is it possible?